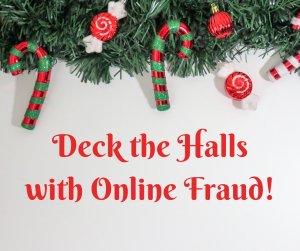 Home » Deck the Halls with Online Fraud…falalalalala ahhhHHH!!! The Holidays are in full swing. There is no escaping it. You can run and you can hide, but you cannot unplug the internet anymore than you can clear the roads of snow or traffic. The Holidays are a festive time of year for many, but for business owners it can be the most stressful, albeit financially gainful, time of year. You worry about having enough inventory, having shifts covered, getting back to customers in a timely fashion. And, to add to the headache, you’ve found yourself smack dab in the time of year where the most fraud occurs. The percentage of fraud attempts goes up every year. Last year 1 out of every 85 transactions was fraudulent. In 2016, 1 out of every 97 was fraud, and in 2015, 1 out of every 109 transactions was fraudulent. Being aware is the first step! Stay safe out there, and happy holidays!